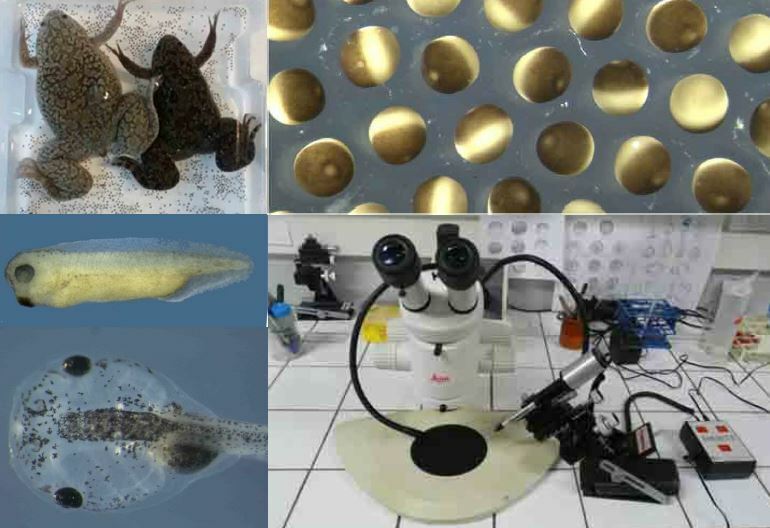 Our platform is based on the Xenopus facility recently established at the University of Bordeaux and integrated in the “Centre Broca Nouvelle-Aquitaine”. Animals are provided by the “Centre de Ressources Biologiques” of the University of Rennes (http://xenopus.univ-rennes1.fr/). The platform is located in the INSERM unit 1035 and provides space and equipment for experimentation on oocyte and embryo. We have 3 injection devices with one equipped for images capture. A fluorescent stereomicrosope allows the observation of transgenic animals. We can perform on demand experiments as collaborations or pay for service. Our platform is intended to provide research teams with the Xenopus embryo model. This model constitutes a powerful vertebrate in vivo model to explore the basic mechanisms of cellular functions. It allows the study not only of the function and regulation of genes but also of the fundamental cellular processes such as proliferation, differentiation, migration and apoptosis. The approaches used rely on gain and loss of function that allow human diseases modeling. Pluripotent cells (animal cap cells) can be derived from the embryo and can be induced to differentiate into a variety of tissues belonging to the three germ layers. The different techniques we use are mRNA, DNA or antisense morpholinos oligonucelotides injection in embryo. Gene expression analysis are based on in situ hybridization and immunohistochemistry. CRISPR-CAS9 strategy can be implemented if necessary. Vestigial like gene family expression in Xenopus: common and divergent features with other vertebrates. Faucheux C, Naye F, Tréguer K, Fédou S, Thiébaud P and Thézé, N.	Int J Dev Biol ( 2010 ) 54, 1375-1382.